First, I would like to thank NetGalley and Thomas & Mercer for supplying me with an ARC in exchange for an honest review. I admit I have not heard of Mark Edwards prior to noticing his newest title on the NetGalley catalog. After a quick read of other members’ general opinion on the author’s previous novels, which was indeed positive, I decided The Retreat was a worthwhile ARC. Much to my embarrassment, it has taken me quite some times until I started The Retreat and I regret its postponement since it proved to be a fine psychological thriller I would recommend to any lovers of this popular genre. In short, The Retreat is written in the psychological thriller aesthetic intertwined with horror nuances as well as a little romance. The style of writing employed by Edwards is rich in vocabulary, thus showcasing his descriptive skills as well as comprehensive knowledge of subjects utilized in the composition of The Retreat, yet it is still digestible and pleasant. The plot is primarily told from Lucas’ perspective, a best-selling horror novelist who comes back to his birthplace, Nyth Bran, to spend time and write a new book at a writers’ retreat owned by Julia, a woman who has experienced great suffering because of her daughter Lily’s mysterious disappearance and immediate drowning of her husband in the river in which he searched for Lily two years ago. Lucas has not been aware of the tragic background of Julia’s family or knowledgeable about the Red Widow myth circulating around the village and interfering with the locals’ existence. He is awestruck when he realizes the correspondence between Lily’s vanishing and the themes of his bestseller and being driven by curiosity as well as sympathy for Julia, he decides to delve into villagers’ lives and local myths and past events. In addition to chapters narrated by Lucas, The Retreat comprises a few glimpses of Lily’s life preceding her unsolved vanishing. The architecture of the narrative is intricate and the mystery unfolds in a suspenseful fashion. There is a myriad of smoothly integrated elements of psychological thriller and horror, some somewhat reminiscent of Agatha Christie’s mysteries, in my opinion: the eerie and atmospheric setting represented by Nyth Bran and the writers’ retreat, the folklore, the river symbolism, a secret society, an apparent medium, the dubious and highly gullible villagers. The explanatory revelation is satisfying and equally thought-provoking and disturbing, in the sense that it makes you dwell on the mankind’s credulousness and inability to separate sometimes good from bad as well as myth from reality when it is imperative to do so. The final scene is bone-chilling and interpretable, leaving you hanging in the air. 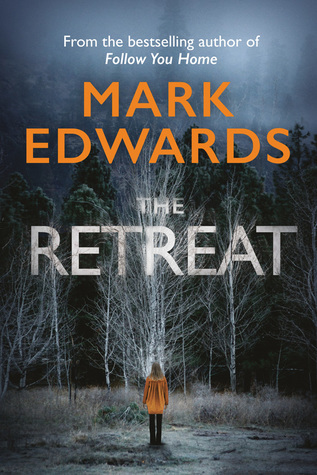 Overall, I enjoyed thoroughly The Retreat and I am looking forward to reading other psychological thrillers written by Mark Edwards. The more people we can turn on to the joy of reading, the better the world will be. I loved this book. One of my top reads of 2018.